Manatees and so much more! Make your plans to visit us today to learn more about these gentle giants and Lake Worth Lagoon. Our field trip options offer a look into the world of manatees and their local habitat, Lake Worth Lagoon. Listen as a Manatee Master storyteller reads colorful books about aquatic species that live in Lake Worth Lagoon. Children, ages 2-5, are welcome. Time: 10 - 10:30 a.m.
Join Manatee Lagoon’s Manatee Masters and an expert speaker for an opportunity to learn about a new environmental topic every month. All ages are welcome to take a seat, listen and ask questions. Learn about Manatees and Lake Worth Lagoon from one of our very own Manatee Masters. Explore scientific wonders at Manatee Lagoon. Children, ages 10-13, are welcome. Join us for adult yoga against the calming backdrop of Lake Worth Lagoon. Classes are led by certified instructors. Participants must be 18 or older. Date: Tuesday and Thursday evenings, 5:45 - 6:45 p.m.; Saturday mornings, 8 - 9 a.m.
Join us for kids yoga against the calming backdrop of Lake Worth Lagoon. Classes are led by certified instructors. Children, ages 3-9, are welcome. 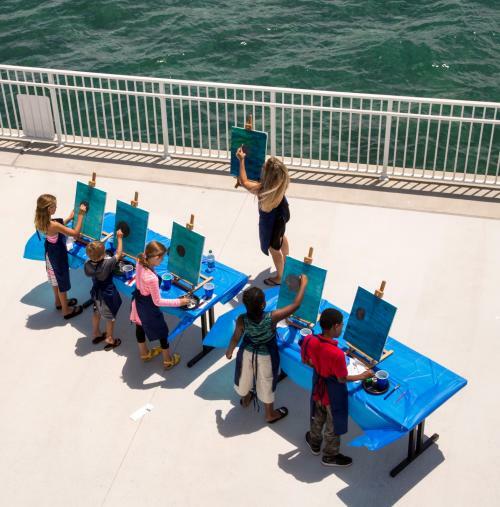 Learn about ocean creatures as you create your own painting under the instruction of our Manatee Masters. Children, ages 6-12, are welcome. Registration for classes will open at 3 p.m. on the Saturday one week prior to each class. Time: 10 - 11:30 a.m.
Join Manatee Lagoon – An FPL Eco-Discovery Center®, Loggerhead Marinelife Center, Get Wet Watersports and the Bahamas Paradise Cruise Line as we take you on an unforgettable adventure to explore the marvels of South Florida’s unique marine ecosystem. Enjoy a fun face painting session by a Manatee Master!